It is important that when contacting a Otterhound breeder that you express health concern issues and ask the breeder what they are doing in order to help mimimize them. Please don't purchase your Otterhound from a petstore which commonly are known to support Otterhound puppy mills. Doing so only promotes inproper breeding ethics and promotes current Otterhound health issues. 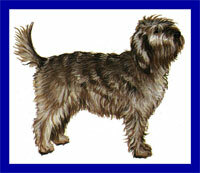 The registries recognize the Otterhound breed standard. Character: This breed is intelligent, affectionate, and lively. Temperment: Otterhounds are friendly to people, other dogs, household pets, and children. Coat: The coat is weather-resistant and rough. All acceptable hound colors are permitted. Care Clipping is not allowed as it ruins the natural look of the coat. It should be brushed as little as possible.